Generation Gone #1 review: Patience is a virtue – AiPT! This will not be an easy book to cram into a single box, if this debut issue is any indication. It would be tempting to fall into a pool of contemporary cliche when describing Generation Gone. It is a story that involves the military-industrial complex, tech geniuses mad with power, transhumanism, broken relationships, societal betrayal, and millennials looking for some measure of justice for the future taken from them. And it would be easy to pick a side and wash the other in judgemental aphorisms about generational misunderstandings and the world in which we live. I have the feeling, however, that this will not be an easy book to cram into a single box, if this debut issue is any indication. There are pages of Generation Gone #1 where the art and the characters are allowed to just breathe. No dialogue, just portraits of a life stunted by unseen forces, whether that be the cancer striking at a loved one or a mad transhumanist waiting to pounce. In the hard-hitting first issue to this new series, storytellers Aleš Kot and André Lima Araújo explore the existential crises that come with despair, over confidence, and the loneliness that their main characters feel even when surrounded by those they love. While working for the secretive governmental organization, known as DARPA, developing the next super weapon of war, tech genius Akio presents his plan to change the human race by using code that, when read, will rewrite the very DNA of the reader, creating true super humans. His Project Utopia is discarded and later confiscated by General West, the seeming head of the program Akio was hired to create, Airstrip One. In his spare time, Akio has tracked three hackers who plan on infiltrating Bank of America to steal back, as Akio puts it to West, what his generation has stolen from them: a future. The potential for cliche comes to its apex with the disaffected millennial hackers, Elena, Nick, and Baldwin. While their educational history is put into question by West upon learning Akio has tracked the trio, allowing them to hack into a fake DARPA server, it is not remarked upon how these three came by their skills. 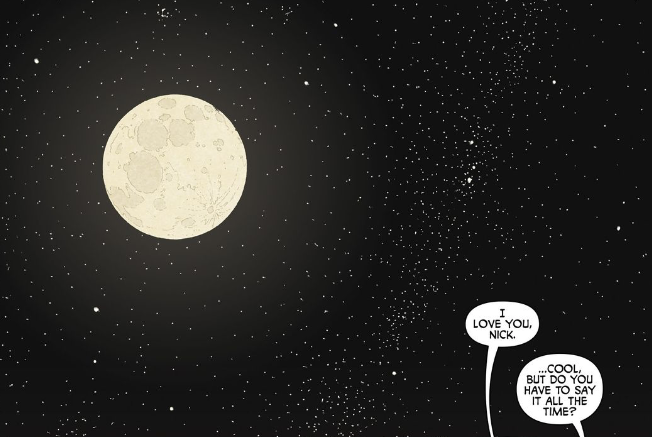 They come together as longtime friends and lovers, in Nick and Elena’s case, each for a different reason, explored in those wordless pages. Elena wakes early, heading to her job as a waitress before going home to care for her cancer-stricken mother. Baldwin, an African-American man, sees the headlines of another black man shot out of unfounded fear. Nick, the narcissist of the group, heads home, walking past pictures of a soldier, perhaps his brother, whose room he passes on his way to a meticulous self-care ritual. Even in their relationships with each other, they are alone. Our first introduction to Nick and Elena defines their relationship throughout the story. Elena is in love with Nick, but he is concerned with control, wanting to turn her off. Later he threatens to break up with her on the spot should she drop out of the scheme to rob their way out of their troubles. His self-centeredness hurts Elena, but he is her anchor. Whether he is mooring her in the tempest that is her life or dragging her down remains to be seen. Nick’s reckless and selfish behavior comes to a head as he nearly costs the team their anonymity while hacking into Akio’s fake DARPA. He is all about the score, the self, the win. Once behind their computer screens, the three hackers are in their element, but Nick is sucked in by the power he commands literally at his fingertips. Akio brings up the isolation of technology in his conversations with the essentially analog West, apologizing for ignoring the chain of command, blaming it sitting behind a computer screen. This exploration of the disconnect of technology with reality can be seen as a take on the disconnect we have with each other through social media or as the disconnect between soldiers and the weapons of war through the use of drones and other technology meant to strike from afar. In the end, as was telegraphed, Akio’s code infiltrates the trio causing six full pages of Exorcist-level fluid loss. Before the three hackers begin to leak out of their eyeballs, however, the code mesmerizes them. They are pulled to their screens tightly, even when addressing each other, attempting to pull out of the operation. They simply cannot look away. It takes rewriting their genetic code to rip them bodily from their computers and from the malaise that brought them to this point. The desperation, the isolation, the nihilism of the new millennium. In the end, Generation Gone sets a provocative table. It could have fallen into any number of cliched traps. Instead, it gives the characters a chance to break through the obvious and, for lack of a better word, soar. Just the one "they're millennials" line. It's a really good book, y'all.